You might observe that this adjustment alone could potentially most of the life expectancy gap with several of the most highly developed countries with “universal health care”, low income inequality, extensive safety nets/cradle-to-grave welfare states, and so on. By all appearances the life expectancy differences between well developed countries of predominantly European extraction are mostly idiosyncratic and are very poorly explained by health system factors like expenditures, physicians per capita, and the like. This is not to argue that health systems are necessarily unimportant, but that past a certain point diminishing returns kick in and factors that appear to be uncorrelated with NHE (as in, not GDP, AIC, physicians per capita, etc) dominate. It says something that the CDC estimates of these mostly non-health system related deaths put the US within spitting distance of handful of other highly developed countries as there is very little reason, in light of the actual evidence, to expect high US health expenditures to produce statistically apparent gains in these sorts of broad aggregate measures. The average age for victims of motor vehicle accidents, homicides, and drug overdoses tends to be substantially less than than victims other major causes of death (e.g., cardiovascular disease, cancer, etc) and therefore these categories can be expected to have a larger effect on life expectancy than naive comparison of death rates might lead you to believe. Similar data from IHME using their age-standardized years of life lost (YLLs) estimates by cause for analogous categories (and overall) leads to similar conclusions even though the particular estimates are somewhat different. This has the advantage of including considerably more countries and offering more recent data, but I cannot attest to quality of the specific data coding used by IHME for their more generalized on-going survey of international mortality in this context versus these CDC researchers more focused research efforts. These probably slightly under-estimate the effect because IHME’s YLLs are normed to country life expectancy and US life expectancy is obviously somewhat lower (without any fiddling). 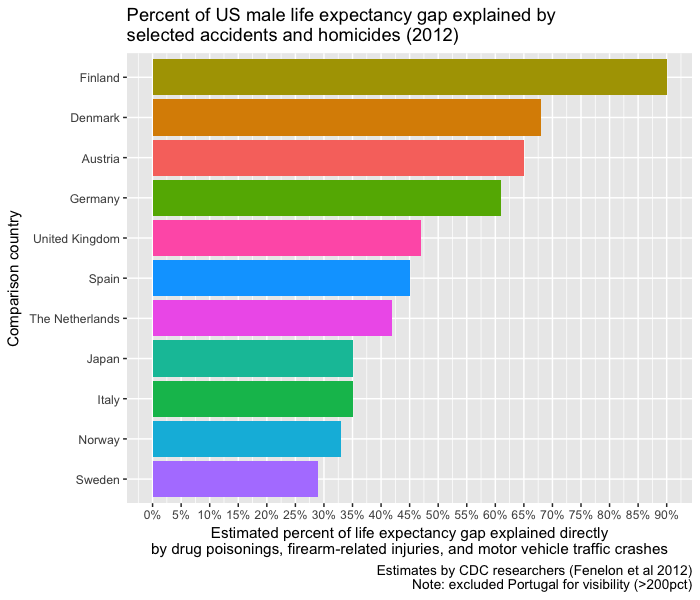 The data suggests motor vehicle accidents, homicides, and drug overdose deaths can explain a large fraction of the US life expectancy gap as compared to several highly developed countries. Obviously this does not account for obesity, diabetes, (historical) smoking, and related lifestyle differences that are likely to have a pronounced negative affects on US life expectancy as compared to most other developed countries and which statistically explains the vast majority of the very large spatial differences in the United States. Next Post - Next post: No, US school funding is actually somewhat progressive. This is excellent, thanks for gathering the data together. If you don’t mind me asking, what do you do for a living? Your deep understanding and familiarity with these most complex issues is remarkable. And (as a result) I can’t help but think that you must be working for one of the places where you consistently source from (OECD, CMS, etc).